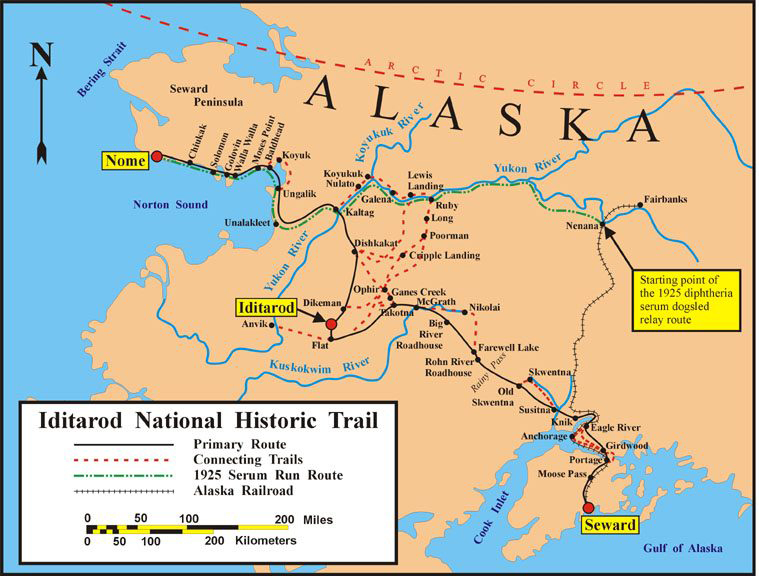 While portions were originally used by Native Americans, the Iditarod Trail as we know it was surveyed in 1908 by the Alaska Road Commission. During the Alaskan Gold Rush, the trail became the main route through Alaska, used for transporting mail, mining equipment, and other supplies from village to village along the route to Nome. By the 1920s, the gold rush had ended, bush pilots began carrying the mail, and the trail was nearly abandoned as the airplane became a viable means of transportation. However, in 1925 during a diphtheria epidemic, the Iditarod Trail was used by a group of mushers to transport a serum in relay fashion from Anchorage to a then icebound Nome. Despite blizzard conditions, the final two legs of the relay were completed by Gunnar Kaasen and his lead dog Balto. The 20 mushers involved had covered the nearly 700 miles in 5 1/2 days. Nicknamed “The Last Great Race,” the first real Iditarod race ran to Nome in 1973. On the first Saturday in March, mushers run their sled dog teams from Anchorage to Nome, a distance of 1150 miles, contending with rough terrain and tough weather. Each musher employs his own tactics to win the race; running in the day or running at night, employing special diets, following different methods of dog handling, and determining his own method and extent of preparation. It typically takes the winner 9–12 days to complete the race. History of the trail from the Bureau of Land Management. From the Alaskan Bureau of Land Management, detailed historical trail map. The trail has a northern route that is run in even years, and a southern route that is run in odd years. The development of the trail as detailed in old newspaper articles. Part B to the above is a 13-page download with an excellent 2-page map and background information. Read about the history of the Iditarod. More info from the BLM. The rules of the race with other information on dog welfare and the associated controversy. Background on what the race is like for musher and dogs. From PBS. Dogs have an endurance and a sure footing in treacherously arctic areas that have made dog sledding in these regions a mode of transportation for hundreds of years. Gee, haw, and other important terms! Information on the dogs that make the race possible at PBS. Meet the breed from the American Kennel Club. Excellent download from the Cleveland Museum of Natural History. Background at PBS on the famous sled dog. Keep track of your favorite mushers. You make the decisions while you learn about dogsledding in this interactive at PBS. Read about the statue of Balto that resides in Central Park. 1925 Nome, Alaska, and you have to make the decisions. “Are you brave enough to survive the journey?” Three levels of difficulty and three different game lengths in this excellent interactive. Modeling clay craft from Crayola. This one at DLTK-Kids.com is challenging, but really neat! Lesson from Jan Brett that illustrates how to draw a Siberian Husky. A Step-Into-Reading account for young children. Great story! This new favorite follows a lead dog who has to be dropped because of an injured paw. The dog decides to go along anyway. A work of realistic fiction that follows Iditarod rules. A young boy enters a dog race to earn enough money to save his grandfather’s farm. But will 10-year-old Willy be able to overcome the Stone Fox team, who has never lost a race? This is not a story about competition, but rather compassion! This 147-page download from the Iditarod Trail Committee offers a variety of Iditarod-based activities covering the content areas of character, consumer science, language arts, mathematics, physical fitness, science and technology, and geography, along with other games, activities, and worksheets. Also from the Iditarod Trail Committee, this 151-page download covers language arts, math, geography, and science along with report suggestions, unit helps, and additional resources. Literature recommendations, ideas, and websites from the LaCelle Family. Using the Iditarod as a jumping-off point, this 72-page unit on weather and climate focuses on frostbite, hypothermia, windchill, and other cold weather conditions. Reading comprehension packet that will work great for wrapping up. From TeachersCorner.net (under Journal Pages). Inexpensive 12-page go-along from Fortunately For You Books. Simple pages for copywork, narrations, or wrapping up. You may also be interested in our Alaska unit study.